We be'cubbin" O'yea This is the RCRadOne on the Honda Cub getting the smackdown from the Baja 5B as Thad is on the steering devise. 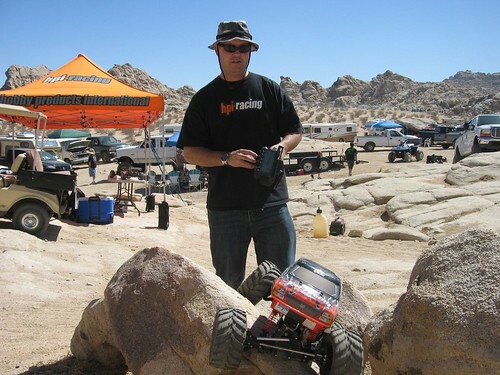 This photo was taken by Derek Buono of Xtreme RC Car Magazine the day prior to the 120 mile endurance trek. Thank you Derek!!!! Funny thing of all this Baja 5B hoopla, I do not have one - YET!!! I will be building one up soon and seeing how you started me as a thread - I will use this to post all my stuff about my Baja 5B. But at the same time, I am no one special, I'm just like the rest of you, yet I do have a "lucky" job of working around something I like doing! Although I do have one now, it needs the proper crawler motor to hopefully be sorted soon! Nice Crawler Is that a Wheelie King? geeee!!! wonder whose truck that is? I Dont Know? I think RCRADONE has more time on it than me. and he has his own too, But, anything for that guy!